Search the catalog at jbat.lbi.org. Search the results of the archival survey online at jbat.lbi.org. The results of an extensive survey of Jewish records in Romanian archives are now searchable in an online catalog for the first time. In 2013, Leo Baeck Institute archivists conducted a systematic inventory of Romanian archival holdings related to German-speaking Jewish communities in Southern Bukovina and Southern Transylvania. An online catalog at jbat.lbi.org, unveiled at Leo Baeck Institute on January 13, describes the location and content of about 600 archival items related to Jewish life, which are housed in various institutions throughout the region. “The pre-Holocaust Jewish communities in these areas of modern-day Romania and the Ukraine are the some of the least known areas of Jewish history,” said Dr. Leo Spitzer, Vernon Professor of History Emeritus at Dartmouth University. Dr. Spitzer’s most recent book, which he co-authored together with his wife, Dr. Marianne Hirsch (Columbia University) Ghosts of Home: the Afterlife of Czernowitz in Jewish Memory, chronicles the city of Czernowitz’s survival in personal, familial, and cultural memory. Dr. Spitzer explained that the difficulty of accessing archives in present day Romania and Ukraine has been one of the major impediments to scholarship. well as historical sketches of the towns in the region and contemporary photos provide context for the information and aid searching. During the initial phase of the project last year, project director Julie Dawson was joined in Romania by LBI digital archivist Timothy Ryan Mendenhall, who served as the project’s technical advisor responsible for designing data collection methods and digitizing materials. Chris Bentley, a systems archivist at Leo Baeck Institute, oversaw the development of the new online catalogue based on open-source software and Dublic Core metadata standards. Mrs. Dawson states that one of the survey’s goals was to promote local engagement with Jewish history in Romania. 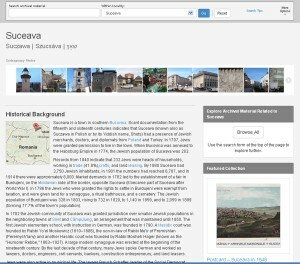 “The attendance and excitement that Jewish cultural heritage events in Romania have garnered in the past prove that the interest is there, but there has previously been a dearth of resources,” said the researcher, who will continue to expand the survey over the next three years with support from the Rothschild Foundation (Hanadiv) Europe.